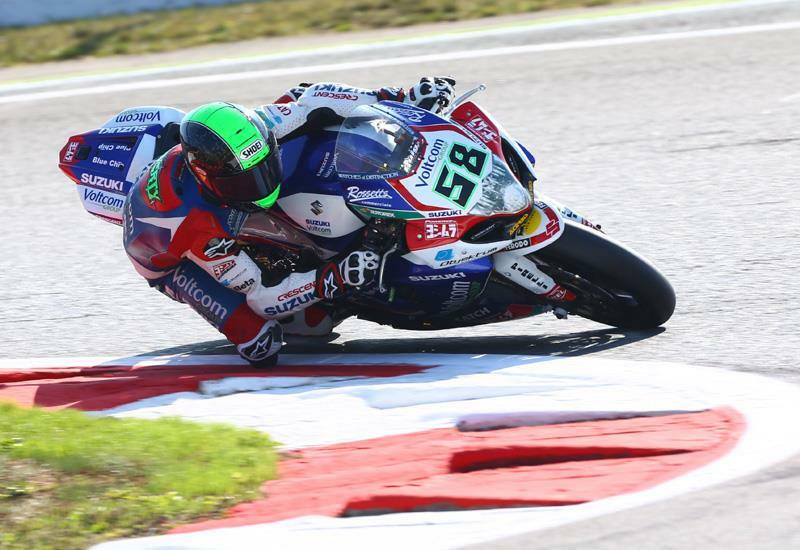 After confirming that he was heading to MotoGP in 2015 with the Aspar Honda team in 2015, Eugene Laverty (Voltcom Crescent Suzuki) found enough pace on the first day at Magny-Cours to finish second in the combined qualifying sheets, 0.272 seconds behind the ebullient Davide Giugliano (Ducati World Superbike). Championship challengers Sylvain Guintoli (Aprilia Racing) and Jonathan Rea (Pata Honda) placed third and fourth respectively in the early running, very close behind Laverty. Recent double Jerez race winner Marco Melandri (Aprilia Racing) was fifth on day one, but over half a second adrift of Giugliano. Despite improving his lap time Tom Sykes (Kawasaki Racing Team) dropped from second in the morning session to sixth overall, one place up on his French team-mate Loris Baz. Chaz Davies (Ducati Superbike Team) and Alex Lowes (Voltcom Crescent Suzuki) were eighth and ninth respectively, with Leon Haslam (Pata Honda) finishing off the top ten. Regular IDM competitors, and Magny-Cours full SBK class wildcards, Xavier Fores and Max Neukirchner (3C Ducati) completed their first day in the WSB paddock in 11th and 12th place respectively. The fastest Evo bike was the Althea Racing Ducati of Niccolo Canepa, in 14th place; 1.6 seconds from the full Superbike class leader Giugliano.